By day ladies don wool socks and Wellies, turtlenecks, moth-eaten sweaters, fleece vests, and Barbour jackets. The men pull on old jeans, work boots, a favorite flannel shirt, sweatshirt, and whatever cap is handy. As they head through the deep snow to the barn, several dogs usually tag along – a Jack Russell here, a Labrador there. 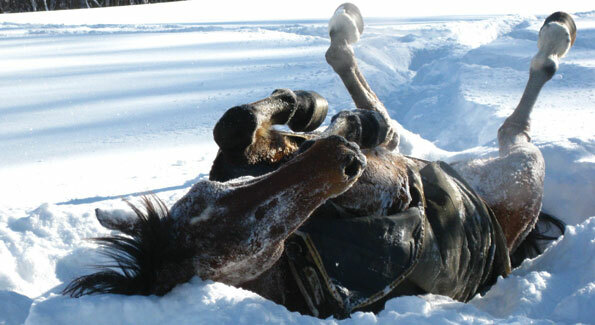 The horses romp and play in snowdrifts as their owners muck out stalls, place new hay in a corner, and fill buckets with fresh water. Some might cave in after a day of hard labor, but not these folks – who never let a bit of snow get in the way of a good time at the annual Middleburg Hunt Ball. That was the case on Valentine’s Day weekend as 140 hearty souls shed their barn clothes for formal attire and gathered at The Briar Patch to let the good times roll. “It was fun to watch the ladies in long gowns pull up and get out of a four-wheel drive truck which was the only vehicle fit for the roads,” reported Tracey Cover, a hunt governor who attended with her husband, Alan Speir. 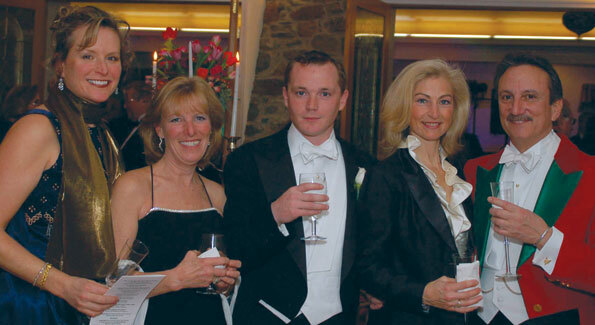 Rose Marie Bogley made it out of her driveway in Upperville as Joint-Masters Jeff Blue and Penny Denegre greeted guests. Penny’s husband, John Denegre, and her mother, Pat Rogers (a longtime fox hunting enthusiast and supporter), were also on hand. Susan and Cab Grayson, Linda and Don Taylor, John Milligan and his wife Patty Milligan, who was responsible for the beautiful tall silver table decorations dripping with flowers, Nancy and John West, as well as ball chairman and president of the Middleburg Hunt Brenda O’Donnell and husband Paul O’Donnell were among the guests. Sam Huff was among the guests sipping an endless flow of Champagne along with a salmon or filet mignon dinner prepared by the ever popular Tutti Perricone of the Back Street Café. Huff, Middleburg’s own Football Hall of Famer, was also one of many locals mourning the recent closure of one of Middleburg’s favorite dining spots, The Coach Stop. He sometimes ate as many as three meals a day there. Since 1958, the simple café-restaurant right in the middle of the village, was “where you always meet someone you know.” During the Redskins’ heyday, team owner Jack Kent Cooke might be spotted with any combination of wives, girlfriends, or local pals. Liz Taylor was a patron while married to Sen. John Warner. Actor Tab Hunter, the late Defense Secretary Robert S. McNamara, and Clintonites Web and Susan Hubbell would visit as well. There is a big gap in the completion of the community right now as eager patrons await a possible new tenant. Who knows what the future will hold? In the meantime, never mind the snow. Spring steeplechase season is just around the corner, so toss those muddy boots in the corner, and start looking for just the right fancy frock.